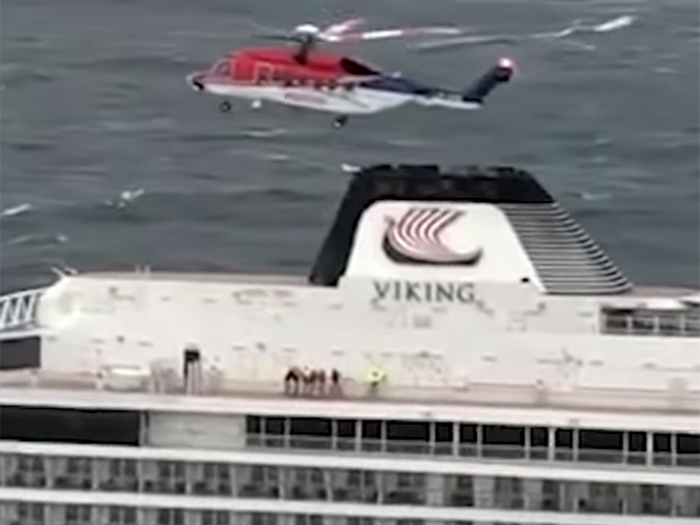 Viking Ocean Cruises reported today that its cruise ship Viking Sky had arrived safely in port Sunday after an ordeal that started when its engines failed during a storm off Norway’s western coast on Saturday. The ship was carrying 1,400 passengers and crew. Conditions were so hazardous that a decision was taken to evacuate passengers one-by-one by helicopters. In all, 479 people had been taken off the ship by the time some power was restored. “It was very nearly a disaster. The ship drifted to within 100 meters of running aground before they were able to restart one of the engines,” Hans Vik, who heads the Joint Rescue Coordination Center for southern Norway, told a local TV channel. Viking Cruises issued the following statement following the incident. At 4:30 pm (Norwegian time) March 24, the Viking Sky docked in the port of Molde. All passengers and crew are safe, and passengers will be flying home starting tonight. Throughout all of this, our first priority was for the safety and well-being of our passengers and our crew. We would like to thank the Norwegian Redningssentral and the Norwegian emergency services for their support and skill displayed in managing the situation in very challenging weather conditions. We would also like to thank the local residents who throughout the whole process have been extremely supportive and hospitable. If you have questions or concerns about any guests please call this number for U.S. and Australia booked guests 1-888-889-8837, and for UK booked guests 07585 779 853 or 0208 780 7900. The next sailing, Scandinavia & the Kiel Canal, which was scheduled to embark on March 27th has been canceled, and guests and their travel agents have been contacted directly. We do not anticipate any additional cancellations at this time.